Joan Collins (right) and supporters returns to Crumlin. Posted in Misc and tagged arrest, Irish Water, Joan Collins at 1:20 pm on April 20, 2015 by Broadsheet. great to have so much free time during the day in such nice weather! She’s a TD you idiot. She’s representing her constituents. Is she REALLY representing her constituents? Yes she is, unlike useless disconnected FF and FG TDs. She’s very popular in that area because she responds to people, calls in to them. she definitely represents my views as my TD – can you say the same about yours? “regarded as being one of the country’s most left wing with four out of the five TDs from centre-left or left-wing parties”. It seems you are all correct! I retract my capitalisation of the word ‘REALLY’, and revert it to being a non-patronising question. She isn’t representing me but, then again, I have a job and take my responsibilities seriously. The same thing happened during the bin charge protests. Drimnagh and Inchicore came out in force to exercise their right to have other people pay for their stuff. Didn’t see any protest marches when the property tax was forced down our throats. A tax that has been paid by people many times over with stamp duty. Their solidarity with home owners didn’t seem so strong then. Where are the protests about USC? I pay more in that per month than I will for water charges for a year. Why does this have to be constantly explained? The reason why there were no marches about the USC is because people were willing to contribute to the financial mess but the Water Charges have become the final straw for a lot of people. If it wasn’t the Water Charges it would’ve been whatever other tax that the government came up with. Sorry Atticus, why did they protest about the bin charges then? Was that also the last straw? The USC doesn’t affect most of these “protesters” because they don’t pay any tax. The household charge/property tax doesn’t affect them because they get their accommodation paid for by the silly taxpayers. I’m all for the social contract and I’m happy to pay tax in order to fund social services but there are two sides to a contract. Joan Collins is absolutey representing me as one of her constituents. It’s galling that she was arrested, along with all the other protesters who have been arrested/ physically manhandled by these corporate garda. I was referring to the local tracksuit mob, which you’re probably a member of. you seem like the reactionary type. You have to laugh at the guy commenting that what do you tell your family you do when you go home guard. Well he tells them he was away for the way working having to put up with a bunch of massive dicks. That guy goes home and tell his family the labour exchange was busy today. What exactly is it that you think the gardai do?! Funny, you sound like a “massive willy” yourself. I didn’t see anything un-peaceful in that video – what am I missing? ur not missin anything, ‘madouveh on the dole’ is a complete troll who goes against the grain on everything put up on broadsheet. Help from who? The UN? Batman? I am not a praying man but…..Superman if your up there please head to Parnell Road. I’m glad that the Gardaí are treating TDs the same as they would anyone else – just my two cents. They treat TDs differently, depending on their political persuasion. The Gardai are a tool of government. Really, the same Govt that cut their pay and conditions significantly? Were you out of country for all of 2014 where we learned that the political system and the gardai are so completely intertwined when one fails, both fail? That it was so politicised the government has been forced to institute two inquiries, and bring a governing body into existence expressly to create a divide between the minister and the gardai? Did you really miss all that? I mean I’m sure I can direct you to a summary somewhere if that’s the case. With respect, its the internet and putting a link up is free (so do it and don’t threaten to do it :) ). I’ll personally pay for the water to drown the majority of these “peaceful protesters”. Just add it to my bill. I’m not a fan of the gardai or the government and I think there were countless bad decisions made in setting up Irish Water, but equally I’m not really sure what these protesters want at this stage. From the video, it looks like gardai were called in because the meter installers were obstructed from doing their work on a piece of public land. Once the protesters didn’t move, they were arrested. It doesn’t look like Joan Collins or her colleague have been subjected to any kind of especially bad treatment, so I’m not sure why the people videoing it are saying the gardai should be ashamed. Between this video and the one of the very patient Dublin Council employee recently posted on Broadsheet, I think the water protesters are losing the support of people like myself. +the cost of Irish Water. I’m sick of this crap. There is no longer any gain to it and at this stage it is only a hindrance and financial drain to the guards. Not to mention adding additional cost to the installation process. This has been admitted even by the government. 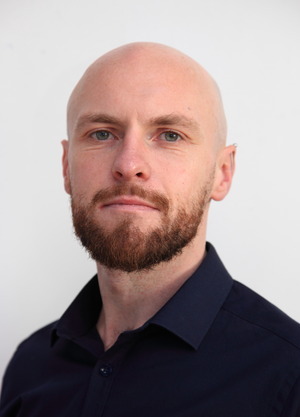 But not one head has rolled, no structures in IW have changed, none of the bad decisions have been revisited and the entity and strategy exist exactly as they were envisioned by Phil Hogan in 2013. I guess for some people it’s a humiliation too far to be forced into being a ‘customer’ of this lamentable company in place of a citizen. That’s not even purely ideological, it’s insulting to have such a car crash foisted on you, that it is a carcrash is admitted, and yet you’re still supposed to toe the line. And that’s ignoring the double-taxation and accountancy trickery the whole thing represents at it’s core. This is so Irish, kick up a bit of a fuss, nothing changes, forget about your concerns and happily go along with it in perpetuity. Depressing. Thanks for the response and glad we both agree on what a mess IW is and continues to be. Aside from protesting at the installation of meters, what would you say the solution is? I fully intend to delay paying any bill to IW – but I understand that there is a law being passed to take payments from people’s wages and this will end up costing me more than if I pay and get the laughable 100 euro ‘grant’. I am genuinely interested in hearing what the alternative is – the protesters have done street protests, the rest of us will engage in disobedience by not paying, but what happens next? I’ll happily pay because water is precious. Some people are already seeing that there are massive leaks on their property that they would never know (or care) about without a water meter. Water is precious and it should have a price. If people were more responsible then this would not be necessary; they would conserve water regardless of its price. Unfortunately, we live in a society where nothing has any value unless it has a price. We live in a society where the government can be as blatantly corrupt, dodgy or self serving as they want, safe in the knowledge that there will always be members of said society who will refuse to see any wrong in what they’re doing. An added bonus for the government is that these people will also go out of their way to belittle the members of society who try to take a stand. I like the way complain about people who go out of their way to belittle the members of society who you say try to take a stand in a hilariously catty tone. Oh get you being all sanctimonious. So glad you like the way complain. Anything else to say? No? They cannot take it from your wages. If they bring in legislation it defeats the original purpose and it will fail the Eurostat test. It would also open the courts to a landslide of litigation from both protesters and other utility companies. Money can be made in the meters being sold off. Increased capital gains tax would have the water supply fixed within years. They have already spent about a third of the €6.5 billion they need for investment – and thats just how much we know of. A transaction tax, increased taxes on gambling, text messages, reduced grants for horse racing, GAA, dog racing, an increase of the top rate of tax, financial penalties for those involved in the obvious corruption, add in Phil hogan’s pension and you’ll have the money to upgrade and fix the supply. 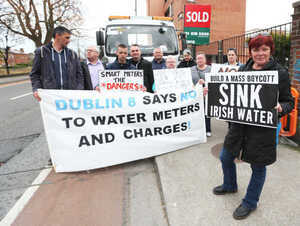 Also, the meter protests are going to continue, not because the ‘Left’ is stirring the people, but because people do not want these meters over there water supply, they do not want water charges and they will not stop until both are history. Make no mistake, people remember the last time FG/Lab tried to bring in water charges. It was 3 years of protest and court cases and controversy, they will not back down and you can guarantee that the water charges will be an election issue. Why should people not pay for water? Don’t say that they pay already because they don’t. Joan “nepotism” Collins. Awful Td awful women. Like Catherine Ardagh of Fianna Fail? Don’t know much about her to be honest. I knew that’s what you meant but just not familiar with her. Joan on the other moaned about nepotism then gave her husband a job. Brought to you in glorious Wobbly-vision(tm). I cycled by the protest this morning and never seen one of these before but have to say the amount of gardai and the 4 cars seemed over the top for the few people who were protesting. It’s intimidation. Very deliberate attempt to antagonize the residents. The very same residents they are supposed to serve. This Irish Water disaster is having a very negative impact on the policing of the state. Rubbish. The protesters know they’re not allowed to obstruct the meter installers doing their job. If anyone is antagonising it is them. They want to be arrested and want to make a scene. I’d say half the people protesting aren’t even from the area. The term peaceful protest is bandied around, that’s far from it. were you there? do you know everyone living in that area? did you recognise someone? @Kevin M – no I wasn’t there, I have a job! They’ve gotten all the “nicer” areas out of the way first. All the less “nicer” areas have been put on the long finger. This is when it’ll start to get interesting. And when the protest loses steam we’ll be stuck with a body as bloated, entrenched, corrupt, self-serving and incompetent as the HSE and in another part of our lives we’ll have become customers and consumers instead of citizens. Plus ca change en Irlande. At least we have a protest dog. haha! + 1 and good to see they voiced there disgust at the end!! They’re not protesting, they are obstructing people trying to do their job. They can stand by and protest all they want, I’m all for that. Did they find Shane in the end…? …or was it Fenton? Unfortunately not. Involuntary teleportation is a well known smart meter side effect. And now, introducing the lead singer of anti-water charge Oasis tribute band “NOasis”, Dónall Ó Ceallaigh!! It is fascinating to see how people have either come full circle or are beating the same tired drum about protesters. play the ball not the man. That all looks rather benign and not at all heavy handed… And who’s this Shane fellah they keep shouting about? The protesters went up to Sundrive Road and block the exit gates of the Garda station. Can someone please tell me how preventing Garda from getting to accident or crime scenes is either peaceful or in the public interest? Well done Joan, representing her constituency unlike any FF/FG/Labour candidate would ever have the balls to. 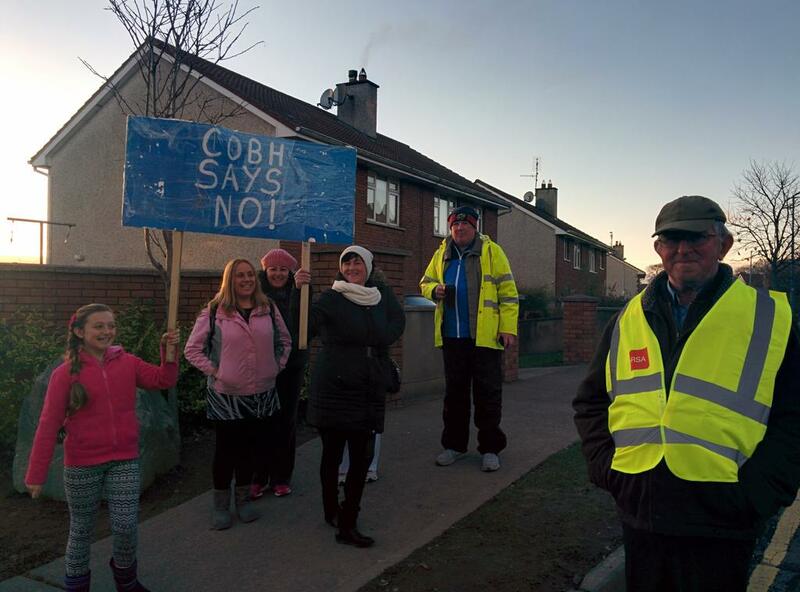 Fair play to all who still attend protests and even extend their care to other neighborhoods for people who are too busy at work to stop Denis O’Briens henchmen from destroying our water supply and lining the pockets of people who would just a soon have the lower classes jailed for being poor. Willie Penrose quit the Labour party because they reneged on a promise and screwed his constituency over. Obviously he didn’t have to spent 20 minutes in a garda cell for it but it was just as effective a stand for his consituents as this. I agree that attending IW protests may not be the best strategy for a TD but leaving the party kind of plays into their hands no? When the green party pulled out of the coalition i thought it was a good move but now where are they? 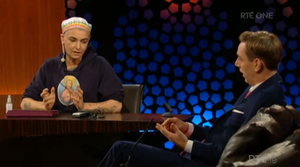 Out of the Dáil and doing fupp all thats relevant to the current political tide. No, what played right into their hands was rejoining the party just two years after he left. If I knew he had done that I’d not have listed him as an example. nothing like a howya for a spot of the auld leeeaveeauh, thanks for the chuckle. Irish Water is not a private company, it is a semi-state company. That is an undeniable fact. I hope it never becomes a private company but the same people moaning about it being bloated etcetera seem to suggesting that if it were a fully public company that somehow it would be less bloated. M0r0ns. paolo, iw is a private company whose shares are owned by the state. These shares could be sold at any time. It’s not that straight forward ollie. Unless I’m missing something, that means both the Daíl and the Seanad have to vote in favour of the sale of any shares as do the people of Ireland. do you not think a Dail and Seanad with a massive majority makes that piece of the legislation irrelevant? Not when the law says that the people have to agree by vote. Besides, this all ignores the reason IW was set up which was to provide a new revenue stream for government and remove the reliance on property sales to fund the state. Not even this government are stupid enough to sell the goose that will be laying the golden eggs. Who do you think should run our water infrastructure? Do you think the public service would run it more efficiently than a semi-state company? For all of the people moaning about wastage and bonuses etcetera, do they really believe that scrapping IW and bringing it directly under a Government department would streamline it? It is questions like these that draw myriad answers from the anti-water charge folks. They are a rabble with no coherent message and they are in a minority but are unwilling to accept that democracy is working against them. Great to see the Gardai doing the work of the government: firstly campaigning for a YES vote and now arresting the opposition. Not political at all. She was released and back at the protest in less than 2 hours. She returned to the protest with boost of publicity that the arrest handed her. Are you sure the gardaí aren’t working on her behalf on the sly? Re. Update: Give us a proper pic of the ‘Smart Meters – The Dangers’ sign. How come everyone is so short? All sort of squat and unhealthy looking. One of the greatest TDs in this Dail – she’s single-handed brought the Siteserv stink to the fore (front page of the Sunday Times yesterday), she challenged the bank promissory notes, and despite the Department of Finance threatening to effectively bankrupt her after she lost at the High Court, she appealed to the Supreme Court. She stands shoulder to shoulder with families facing eviction. And she’s a backbone for the water protests. As to what the protest is about – EVERYONE in this country knows that once the principle of charges is accepted, the €60 a year charge will rocket. You can debate whether it’ll be €300, €500 or €1,000 but it WILL rocket, and this TD knows that this the point at which the principle is accepted or rejected. More power to you Joan! I thought the principle of charges had been accepted. Don’t we already pay? “I’ll happily pay because water is precious” “Water is precious and it should have a price”. I’m starting to think that IW are employing people to troll the comments sections of Broadsheet. Some of these pro IW comments read like pure propaganda. Yawn Neil. Go to the journal, maybe blame the bankers and bond holders? We haven’t heard that before. Reasonable people will pay because they understand simple economics = We spend more than we take in for services, not servicing debt!!! Hi Neill, I’m a real person and would be happy to debate this with you in person. Are you suggesting that water isn’t precious? Are you suggesting that potable water isn’t a scarce resource? I don’t like Irish Water and wish it had been done differently but that doesn’t take away the need for preserving water and the water infrastructure. If water is so precious, and a human right, then IW should stop charging for water in… and double the charge for taking it back. Hey presto, same bill, but you’re only paying them to take the, ahem, dirty water. Who would argue that sewage treatment is a human right? +1 Haha, very clever point. I voted for Joan Collins as the best bet from a myriad of the usual clowns that care next to nothing about real people and real issues. Whatever faults you can find about her they are far outweighed by her positive actions and hard work trying to support some of the most vulnerable in our community and leading by example for many other politicians and communities. Some of the comments above are shamefully ignorant, bigoted and classist. If people like you are voting we can all expect more of the same problems from here on in. If there’s a hell below, we’re all gonna go.